January 3, 2015 — They say that it’s as acidic as Coca-Cola, which can dissolve the rust off car batteries. That new microscopic species have evolved there that feed on metal like tiny robo-termites. They say it only costs two dollars to see for yourself. I can vouch for one out of three of those statements. 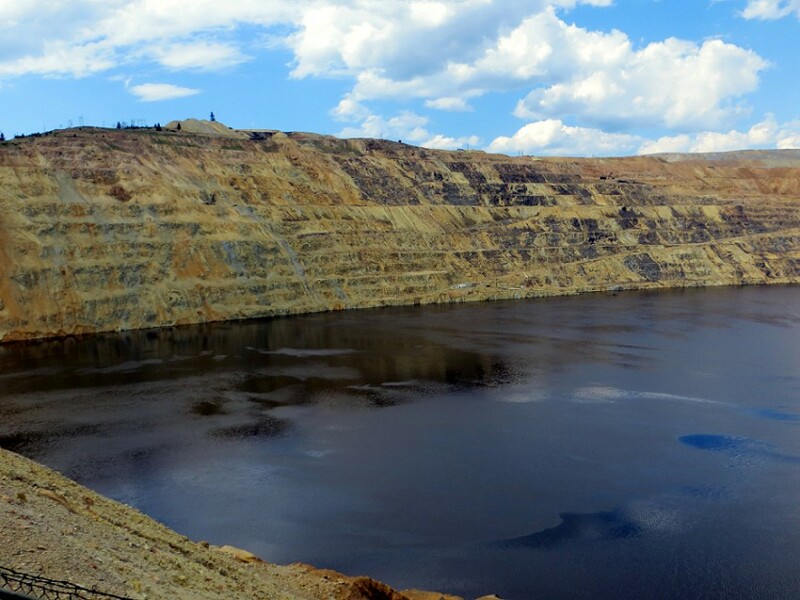 The Berkley Pit in Butte, Montana, is a 1,780-foot-deep hole that’s about a mile long and half a mile wide and is half-full of rust-colored groundwater. Or, you know, half-empty depending on your perspective. 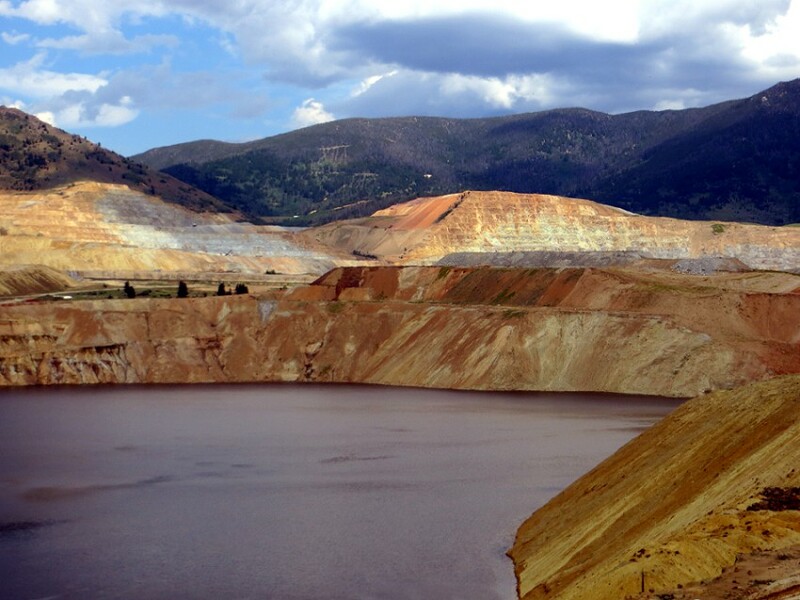 The large pool is the toxic side-effect of an open-pit copper-mining operation that opened in 1955 and then closed in 1982. 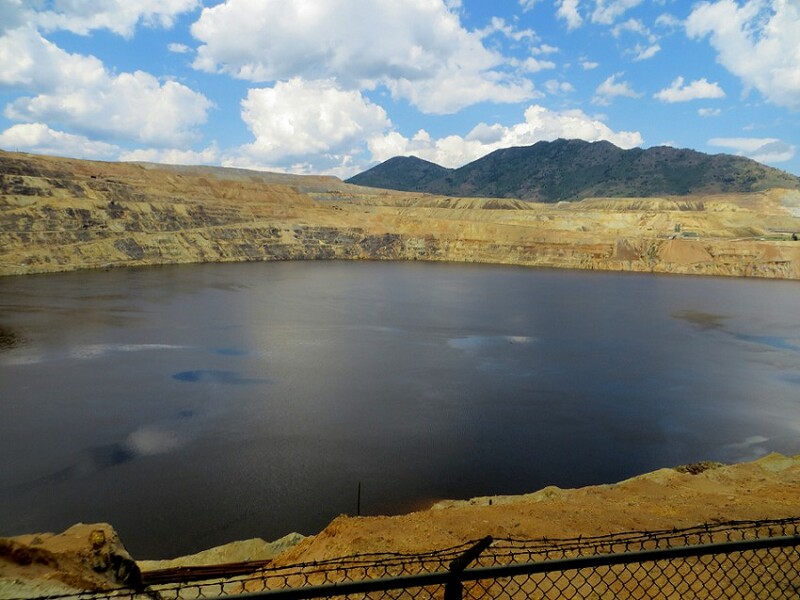 If the water from that pit ever slips into the surrounding water table, the people of Butte will have to eat soup through their veins for the rest of their lives. And it’s estimated to happen by 2020. But it’s also a tourist attraction. 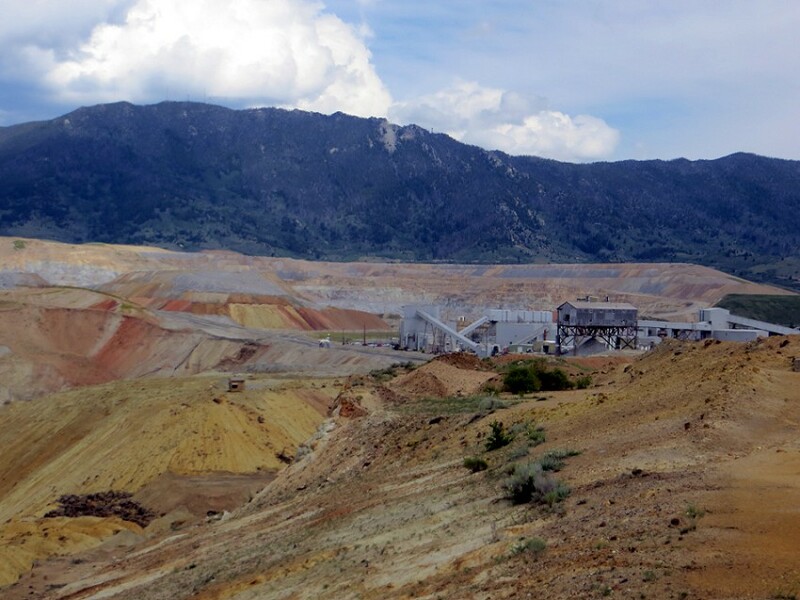 My friend and I were on our way to Yellowstone National Park, and I convinced him to stop at this small Superfund site at the edge of the city in the shadow of a 90-foot-tall white statue of Mary 3,500 feet above on an adjacent mountain. The statue was built by a devout religious man who was tired of having an invisible God, the presence or absence of which seems more than just a philosophical question in the face of the fact that we have Superfund sites. Superfund sites are hazardous waste areas that have been singled out by the federal government as dangerous enough for a massive long-term cleanup to avoid horrific damage to the populace, the environment, and our collective consciences. I’ve only visited one other in my life, Love Canal in Niagara, New York, and that smooth, verdant lawn of grass covering a hell of chemical soup gave me such a peaceful Eagles feeling that I couldn’t help but visit the next one that I came near. We walked into a small, homey trailer-like building filled to bursting with shiny souvenirs probably manufactured in far-off places despite their very Montana-ness: bear claw magnets, polished stones, Native American bric-a-brac, books on giant white statues of Mary. But we weren’t there to gift shop. We were there to see a pre-tragedy. 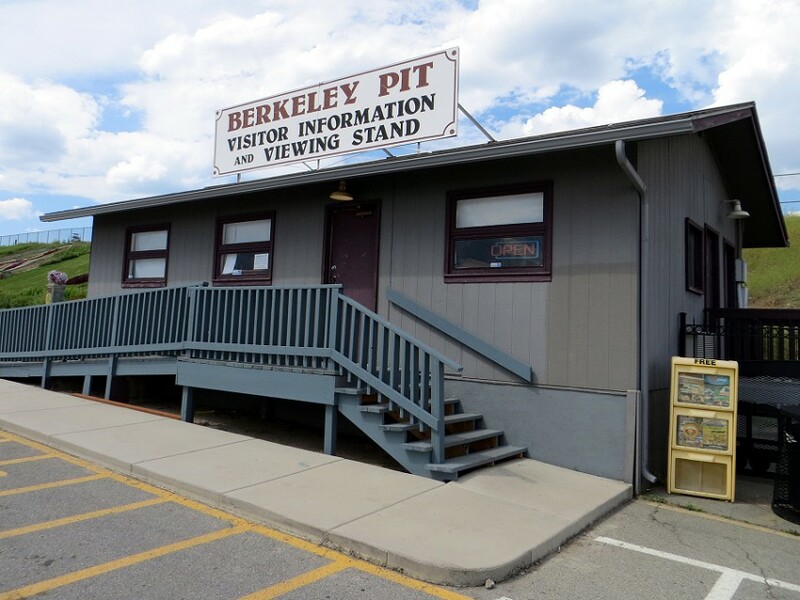 After paying a pittance to see the pit, we walked down a long, lighted tunnel with rounded edges almost like the passageway of a spaceship until we were deposited onto a wooden deck overlooking what could indeed be the setting of a science fiction movie: The Berkley Pit itself. 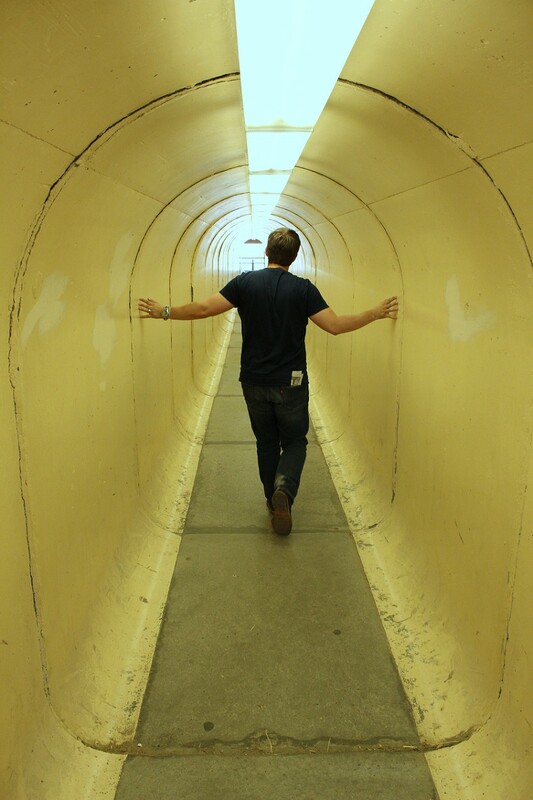 It was…not too scary, being as it was a placid tub of dirty water. But with the backstory coloring our perspective, I kept waiting for a blurble somewhere out in the center, a momentary surfacing of a hump of slimy back, for something disfigured and unnamable to rise from its depths like those things in the movie Leviathan, tortured and torturing at the same time. Various placards scattered around the observation deck broke down the history and science in an upbeat fashion, while a loudspeaker blurted forth its narrative less like the pit was a ticking doomsday clock and more like it was an artistic feat that rivaled Mount Rushmore. And even though the tourist verbiage veered away from the depressing nature of the place, this was a death-trap puddle where flocks of birds have died just by landing on its surface, where extremophile forms of bacteria and fungus have sprung up like those creatures that live on volcanic fissures on the bottom of the dark ocean. Where simple H2O has transmographied into a brew with an acidity rating close to soda or vinegar. Honestly, for the seat of inevitable disaster that it is, scientist and engineers are persistent in pointing out that the pit is safe and contained for now and will be until 2020 when the water finally rises to the point that it will infect the water table. And those guys are pretty smart. Except that the Berkley Pit happened in the first place. But that’s us. Pretty smart until we’re pretty dumb. As I stood there gazing deep into the slight ripples in the copper pool, I felt keenly and almost psychically that someone was doing the exact same thing at the moment above the sapphire waters of Crater Lake and the glass-clear seas surrounding the Caribbean islands. Of those sightseers I could only think that I was the lucky one to see such a rare example of un-nature. Because I’m a twisted mess of a person. But at least in 2020, I’ll be far away from Butte, Montana.